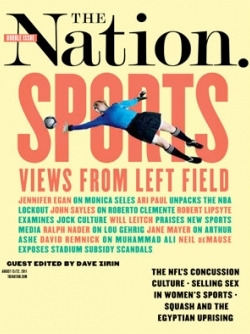 For only the second time in the magazine’s long history, The Nation’s upcoming issue will be all about sports. There will be plenty of politics as well. Politics have been present and held a prominent place throughout US sports history. From all the labor problems between the players and owners to athletes speaking out against war and social injustice. There’s also the economics side of sports and that is just as a political issue as anything else. As a long time sports fan and as a person greatly interested in politics I am really looking forward to reading this special issue of the magazine. editor of the American Communist Party newspaper The Daily Worker — and used that platform to wage an early battle against baseball’s color barrier, died Sunday in Walnut Creek, Calif. He was 98.
classes the newspaper championed were hardly lining up at newsstands for its box scores. But the paper, published in New York City, did have a sports section, run by Mr. Rodney, who was a card-carrying member, in the parlance of his day, of both the Communist Party USA and the Baseball Writers Association of America. In the 1930s and early ’40s, Mr. Rodney, a grandson of Jewish immigrants from Europe, became an outspoken voice among sportswriters, apart from the black press, in condemning racial discrimination in professional sports. Running a six-day-a-week Daily Worker sports section that he introduced in 1936, more than a decade before Jackie Robinson broke the major league color barrier, Mr. Rodney pressured the baseball commissioner, Kenesaw Mountain Landis, and the major league club owners to end baseball’s racial barrier. and managers praising the talents of black players to buttress his argument that they offered a vast talent pool. He publicized Communist-led petition drives aimed at ending the majors’ exclusion of blacks. Lester Rodney grew up in the Bensonhurst section of Brooklyn, became a Dodger fan, covered sports for the New Utrecht High School newspaper, and played basketball and ran track. His father was a staunch Republican who had owned a silk factory but was ruined financially by the 1929 stock market crash. competition as a means of appeasing the oppressed masses. So he wrote a letter to the paper’s editor telling him to lighten up. at a time when the Communist Party was seeking to broaden its appeal in the United States by reflecting the interests of working-class men and women. Mr. Rodney joined the party because Daily Worker staff members were expected to do so. Press-Telegram. He retired in 1975. LaGoy; and his companion, Mary Harvey. His wife, Clare, died in 2004.